The Distribution Center is a collection, storage and distribution point for donated clothing, furniture and household items that are given at no cost to anyone in need. It operates from a 5,400 square-foot warehouse in the northeast section of Wilmington. Many people in transition, including those leaving emergency shelters for more permanent housing, have little or no means to purchase these living essentials. 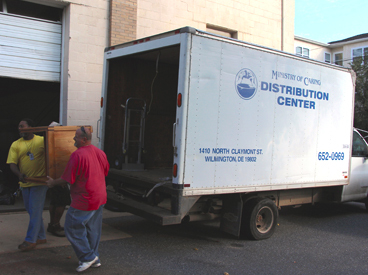 The Distribution Center collects and gives out clothing, housewares, and furniture at no cost to those in need. The Job Placement Center helps disadvantaged and/or chronically homeless men and women, including the unskilled, to develop employment skills and obtain work. Individuals committed to learning and to maintaining employment in a specific field may enroll in one of the training programs operated by the Job Placement Center, when available. The Job Placement Center strives to help individuals develop life skills for employment. To this end, staff focus on providing assistance in job searches, resumé building, completion of employment applications and follow-up. Ongoing case management services also enable the Job Placement Center to help clients retain jobs. A client receiving assistance writing her résumé at Job Placement Center. The Pierre Toussaint Dental Office provides basic dental services to residents of all three counties in the State of Delaware. Services include fillings, cleanings, extractions, dentures and partial dentures to uninsured poor patients ages 19 to 64. The dental staff consists of a full-time dentist, a part-time dental hygienist, two full-time dental assistants and a full-time administrator. 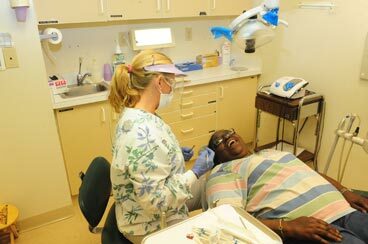 The skilled dental staff of the Pierre Toussaint Dental Office provide care for the poor, ages 19 to 64. 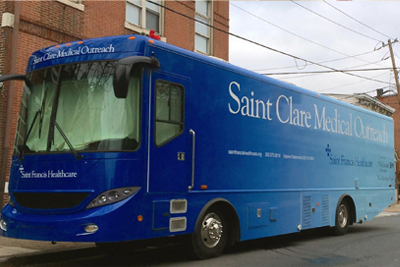 A cooperative project between St. Francis Hospital and the Ministry of Caring, St. Clare Medical Outreach brings basic medical care to the uninsured. St. Francis Hospital provides a full-time physician, a registered nurse, a bilingual medical assistant and a driver for the 34-1/2- foot custom van that travels to the poor at Ministry of Caring sites and in other neighborhoods in Wilmington, Delaware. Two examination rooms are available for walk-in services. Referrals are made as needed to various volunteer doctors of specialized medicine. When patients are referred to St. Francis Hospital in Wilmington, the hospital incurs the expense of any ensuing diagnostic tests and hospitalizations. This 34 ½ foot custom medical care van travels to the poor at Ministry of Caring sites and in other neighborhoods in Wilmington, Delaware.